the horse who played The Pie. 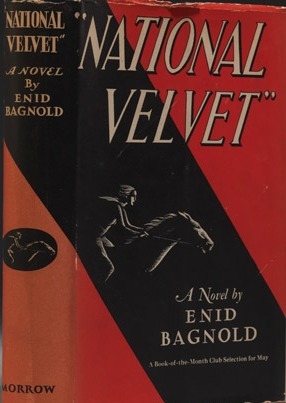 "Edwina, Malvolia and Meredith were all exactly alike, like golden greyhounds. 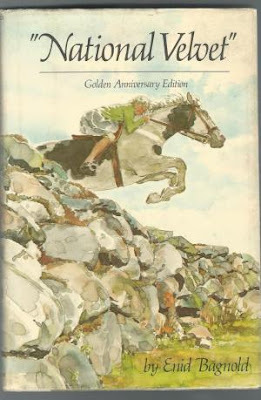 Their golden hair was sleek, their fine faces like antelopes, their shoulders still and steady like Zulu women carrying water, and their bodies beneath the shoulders rippled when they moved. They were seventeen, sixteen, and fifteen. 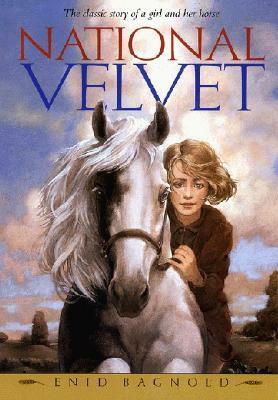 Velvet was fourteen. Velvet had short pale hair, large, protruding teeth, a sweet smile, and a mouthful of metal." 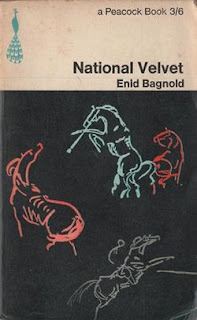 That's how author Enid Bagnold introduces Velvet, the main character in her novel National Velvet. Velvet was also scrawny and prone to vomiting whenever she got nervous. 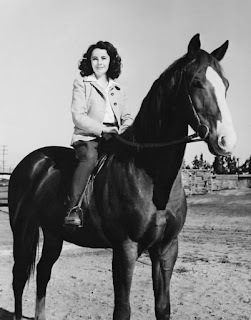 So of course Elizabeth Taylor would be the first person you'd think of to play her in a movie. 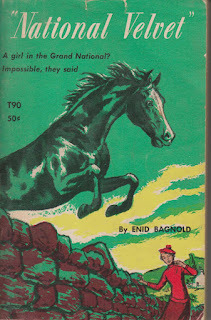 I never was able to figure that one out, back when I was a horse-mad girl. I knew Taylor was regarded as a great beauty, and that even as a kid in the 1944 film she was cute as a bug. But that's just the thing. 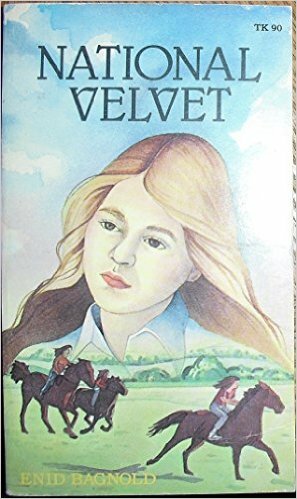 Velvet was a scarecrow. of the bond they had and never forgot him. A wonderful, beautiful character--as are all the people in National Velvet, which is not really a "kiddy" horse tale but rather a story about the complexity of family relationships, about hopes and dreams, about regrets and longings--but still, she is an odd, awkward girl quite different from her lovely sisters. It made me cross that they turned her into a dreamy, pretty girl in the film (though I do like the film a lot, including Taylor's performance, on its own). 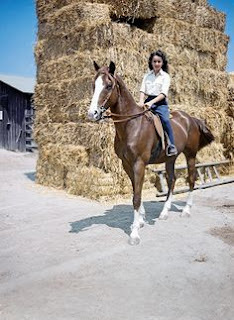 The original 1944 review in The New York Times describes how "little Elizabeth Taylor...plays the role of the horse-loving girl" with a "face alive with youthful spirit, her voice has the softness of sweet song and her whole manner in this picture is one of refreshing grace." 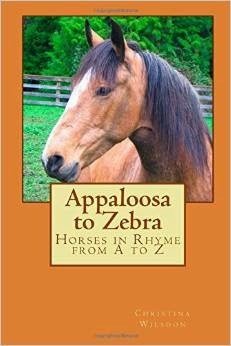 It also was vexing to see what the short, strong black- and white-spotted horse, The Pie, turned into. 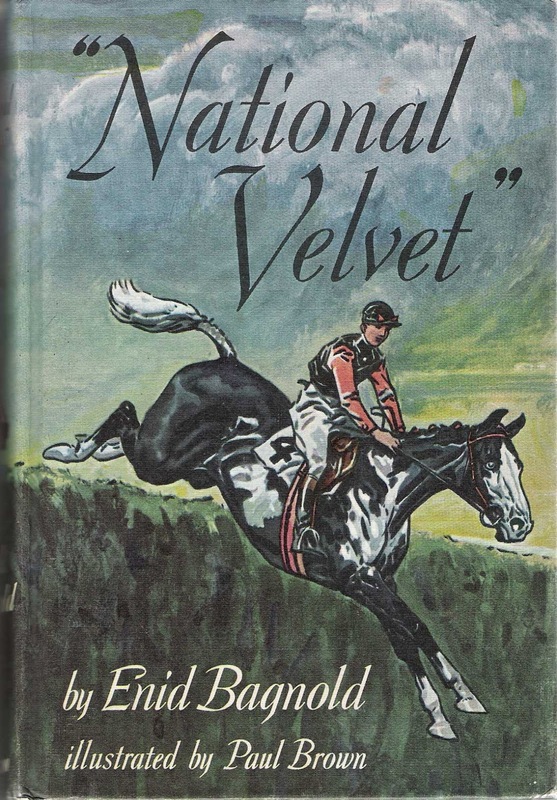 In the book, Velvet calls him "the piebald" and dubs him The Pie. 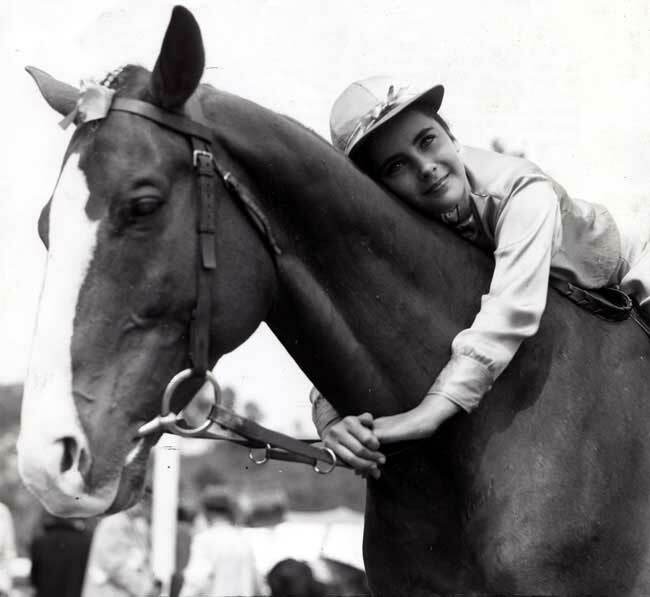 In the movie, he's played by a rangy chestnut Thoroughbred called Pie, short for Pirate. hay our horse Avi would eat in a week. 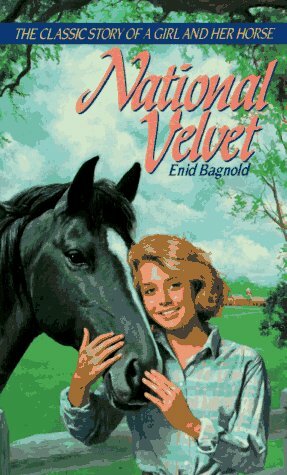 Horse girls generally insist on fidelity to the book when it comes to horsy particulars, so I was ready to write to the Lord High Mayor of Hollywood about this pressing matter. It would be a long time before I'd learn that directors don't want spotted horses in movies because it's difficult to swap in other horses to play their roles. It's well nigh imposible to find exact matches, and though it's easy enough to touch up a star on a forehead, painting an entire animal is not. 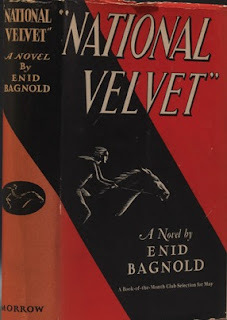 As I was rereading National Velvet (which, incidentally, features one of the most excellently portrayed younger brothers in the history of literature) and noticing just how very much Bagnold did not write this book solely for children (it features a slaughterhouse, a suicide, blood, and plenty of exclamations of "hell"), I found myself lost in the rabbit hole of the Internet looking up different editions of National Velvet to see how Pie and Velvet were portrayed. It was pretty amusing. Check it out below if you feel a similar need to procrastinate. 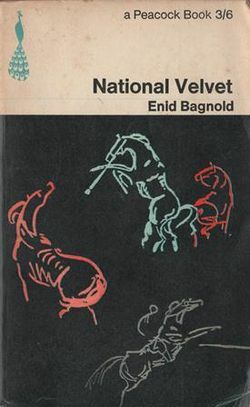 For starters, here is the gold standard, my childhood copy: The Pie is a piebald. 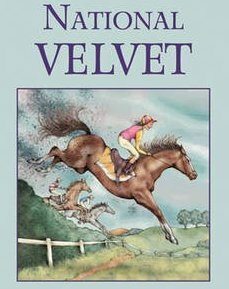 Velvet is simply a jockey. The first edition of National Velvet featuring illustrations by renowned equine artist Paul Brown was published in 1949. It's a vast improvement on the cover of the 1935 first British edition of the story, which is pink with black writing and nothing else. The pink and black, to the publisher's credit, wasn't chosen because pink is a "girl color." 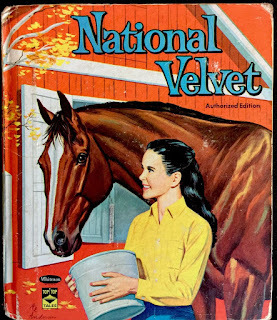 They are the colors Velvet chooses for her racing silks, and her conspirator, Mi, flat-out tells her she and The Pie will look horrible. but the image captures her drive and The Pie's willingness. 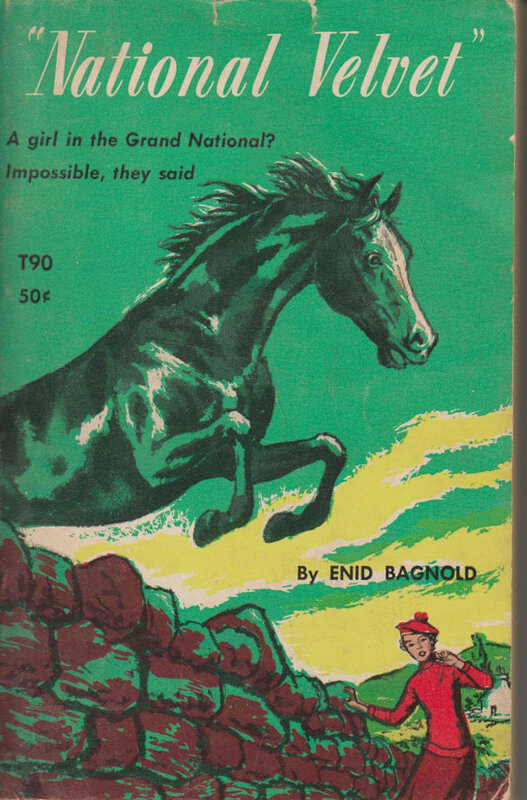 which were done by Bagnold's daughter, the inspiration for the story. book self or his chestnut movie self. Pretty, though. A series of coloring books based on a TV version of National Velvet were produced in the 1960s. What up with the hunt attire, Velvet? Women traditionally (and the English equestrian world is nothing if not traditional) wear black or navy coats. Red is reserved for Master of Foxhounds and other hunt assistants. Though that has surely changed as more women moved into those ranks. 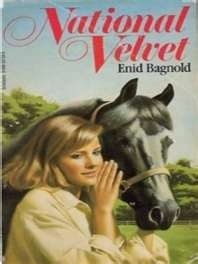 Still, Velvet in the 1940s-1960s...well, wait a sec. 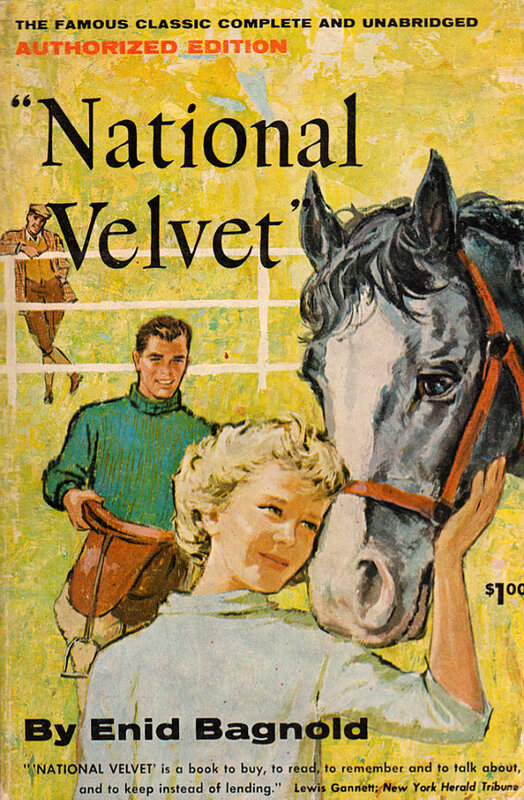 Who am I to quibble over the coat color worn by a girl who went undercover as a male jockey riding in and winning the Grand National steeplechase? Oy. Never mind. 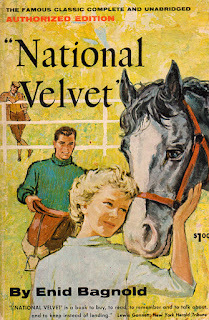 But I am a bit worried about her coming off the horse in this image. And she needs a hair net. 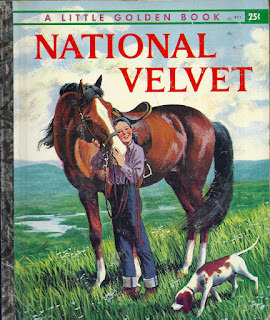 A 1962 picture book based on the early-60s NBC TV program loosely based on National Velvet. dairy farm who owned a Thoroughbred stallion. Because life is like that. aurora borealis is particularly active. Browns' carthorse. I don't know who the dapper fellow by the fence could possibly be. again at being Master of Foxhounds. 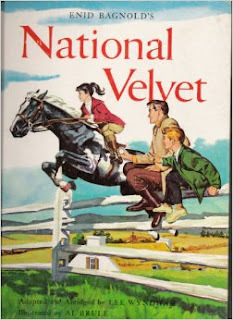 version of National Velvet in our future? The Pie will become The Twi (short for Twilight)? A 1991 paperback, with Velvet sporting freshly blow-dried locks and a Western-style shirt. Black Beauty, a calm and gentle steed who would barely bite a carrot, let alone his dear rider. over her spot. Black Beauty once again stands in for The Pie. He also appears to have shrunk. as long as your torso. Maybe she is kneeling and The Pie is a mini. and I drew all the time, with elegant legs and flying tail, so as an illustration I love it. It's not at all Grand-National-realistic but never mind. this giant head that has suddenly materialized on their horizon. wearing a coat when they went to a horse show. 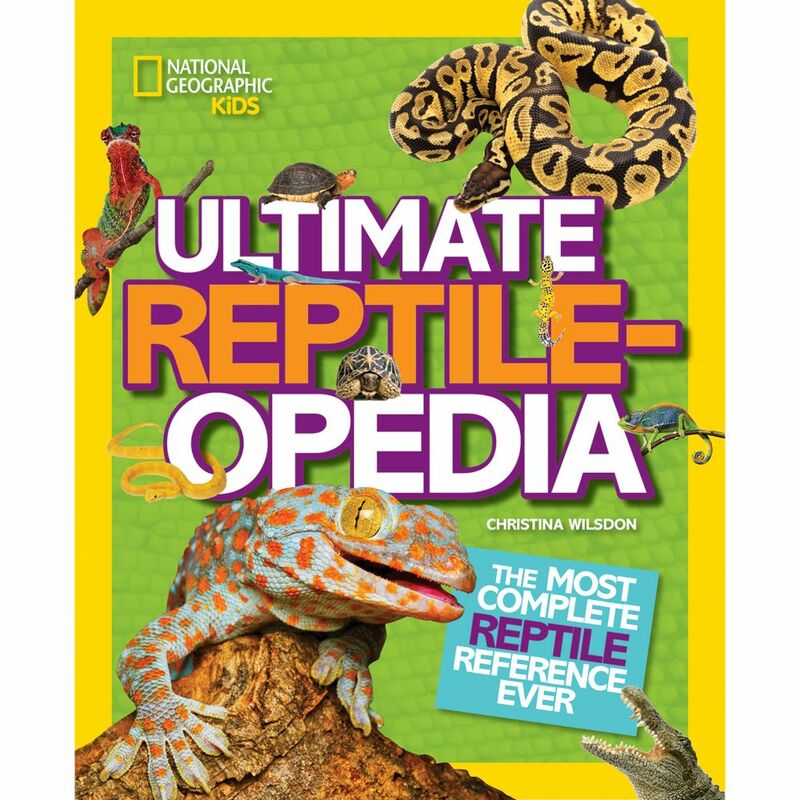 Frogs, Bugs, and Arachnids, Oh My! I've been busy settling into a new full-time job, and certainly having a full-time job has been a fine thing; however, I've somehow fallen behind in everything else I do. And here it is ruddy October already. Oh well. Here are a few of the animals I met on safari in the garden this past summer. This guy showed up in a drain at the top of our driveway, hopping up and down and bashing his head against the grate. I caught him and hung on to him long enough to get a photo. Above, he's briefly escaped and sitting, astonished, before I caught him again. I am pretty sure he is a green frog. OK, don't try and get funny with me. I know he is a frog. I know he is green. I mean a green frog, as in Rana clamitans. Green frogs are native to the eastern United States but now found in parts of Washington State. Such as our drainage ditch. I, too, am native to the eastern United States, so we had quite a friendly chat before I set him free. We often hear him croaking loudly on damp evenings. Gracious. Would you just look at what's going on in the daisy patch. I'm afraid all I can tell you is that these are beetles. 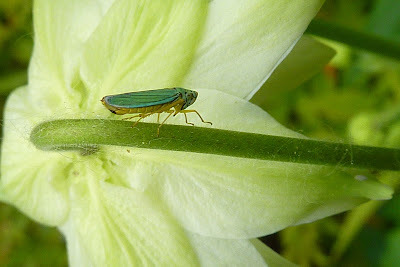 My field guides and the Internet are letting me down big time, hence no more specific identification. Whatever they are, they are making more of themselves. They also trundle about the daisies covered with pollen so they're helping to make more daisies, too. Sometimes the whatever-they-are beetles get all shy and stuff, and hide, which is rather ridiculous seeing as to what they're perfectly happy getting up to right in the town square. This fat little fellow is a well-fed aphid. One of our many garden snails enjoying an ooze along a rock on a very wet day. I can't see the pattern on the head of this lady beetle, so I can't tell you if it is a spotless lady beetle, even though it is obviously spotless, because it could be a spotless spotted beetle. This may be a six-spotted orb weaver. Or it may not. I often see crab spiders but this doesn' t look like any of those even though this capture of a bee is typical of crab spiders. (Alas, crab spider photos from this summer are probably miscatalogued and I can't find them....) But there appears to be webbing over the unfortunate bee's abdomen, which lends credence to the orb-weaver bit. The daisy petals were curled around the grisly scene. I was wondering who was chewing the petals neatly off the daisies and then gobbling their interiors. I found this guy scooping up the yellow area as if he were face first in a big bowl of lemon custard. 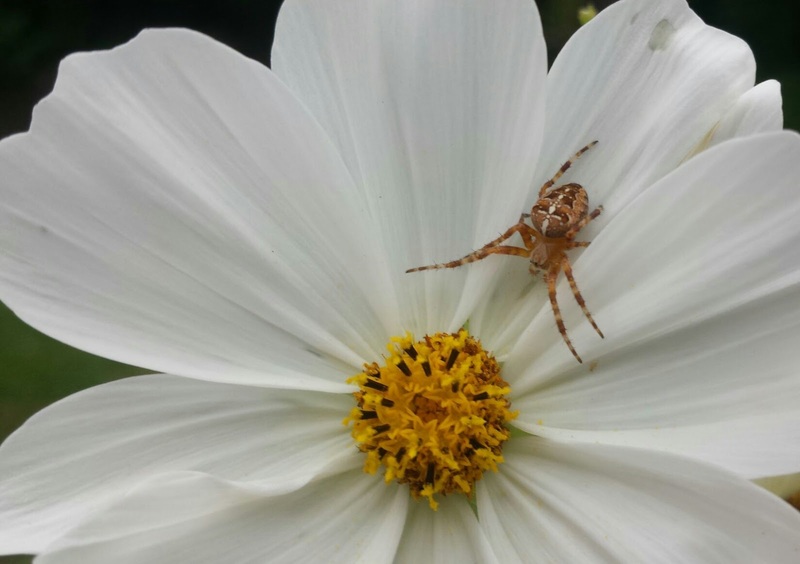 A European garden spider checks out the center of a cosmos. 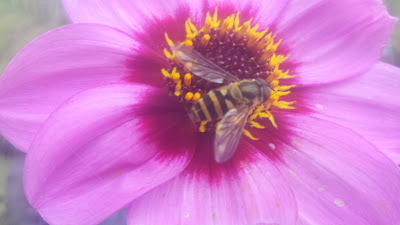 A hoverfly sips nectar from one of the dahlias. Completely harmless but looks like a bee so that predators and nosy people hesitate to come close. 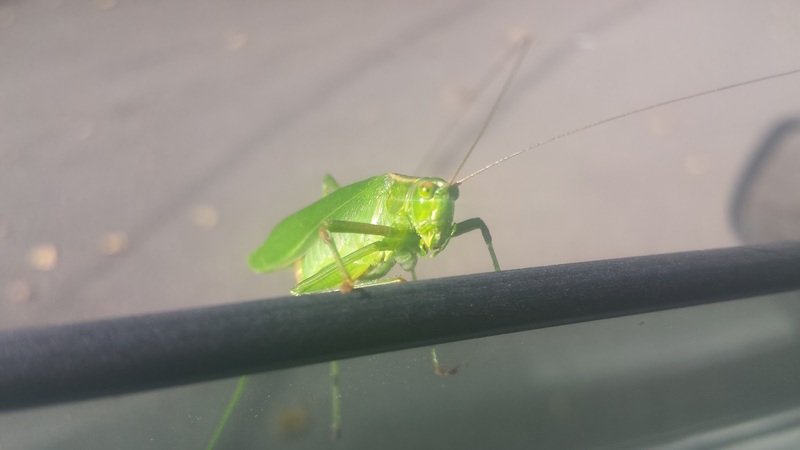 This cheerful guy was perched on my Subaru window one summer morning. All I can tell you is that it's a katydid. I'm afraid my so-called "Insects of the Pacific Northwest" field guide has only about 5 orthopterans in it, and green katydids aren't among them. He was very large and had splendid antennae. A leafhopper tiptoes along a 'Munstead White' columbine.